To Cite: Shirali G A, Malekzadeh M. Predictive Analysis of Controllers’ Cognitive Errors Using the TRACEr Technique: A Case Study in an Airport Control Tower, Jundishapur J Health Sci. 2016 ; 8(2):e60322. doi: 10.17795/jjhs-34268. Background: In complex socio-technical systems like aviation systems, human error is said to be the main cause of air transport incidents, accounting for about 75 percent of these incidents and events. air traffic management (ATM) is considered a highly reliable industry; however, there is a persistent need to identify safety vulnerabilities and reduce them or their effects, as ATM is very human-centered and will remain so, at least in the mid-term (e.g., until 2025). Objectives: The current study aimed to conduct a predictive analysis of controllers’ cognitive errors using the TRACEr technique in an airport control tower. Materials and Methods: This paper was done as a qualitative case study to identify controllers’ errors in an airport control tower. First, the controllers’ tasks were described by means of interviews and observation, and then the most critical tasks, which were more likely to have more errors, were chosen to be examined. In the next step, the tasks were broken down into sub-tasks using the hierarchical analysis method and presented as HTA charts. Finally, for all the sub-tasks, different error modes and mechanisms of their occurrence were identified and the results were recorded on TRACEr worksheets. Results: The analysis of TRACEr worksheets showed that of a total 315 detected errors, perception and memory errors are the most important errors in tower control controllers’ tasks, and perceptual and spatial confusion is the most important psychological factor related to their occurrence. Copyright © , Ahvaz Jundishapur University of Medical Sciences. This is an open-access article distributed under the terms of the Creative Commons Attribution-NonCommercial 4.0 International License (http://creativecommons.org/licenses/by-nc/4.0/) which permits copy and redistribute the material just in noncommercial usages, provided the original work is properly cited. 1. It provides a useful and high-level description of possible errors and their classification. 2. It presents specific information about perceptional functions that have flaws and their mechanisms. 3. It expresses the psychological reasons for any error’s occurrence. 4. It expresses situations that affect the errors’ occurrence. 5. It allows various errors to be retrieved and identified using the key questions. Due to the importance of identifying possible errors in the aviation industry and particularly air traffic control, this study was done with the aim of conducting a predictive analysis of controllers’ cognitive errors using the TRACEr technique. For this purpose, the root causes of controllers’ errors were identified in the airport control tower. This study is a qualitative case study. The environment for identifying errors is the control tower of an airport in Iran with a population of about 15 controllers in five shifts of three persons. In each shift, there is one person who serves as the main controller and two auxiliary controllers. The main controllers have rating licenses and are responsible for their shift. To identify and better understand the errors, it is useful to gain familiarity with the environment and equipment in this study. The flight control tower (tower) is responsible for providing air traffic control service in a usually cylindrical area around the airport and up to a certain height; this area often varies according to the number of flights and facilities of each airport. Those who are responsible for controlling the terminal traffic are called controllers. Controllers, according to the work area classification, are divided into three units: the tower, the radar approach control unit (approach), and the flight path control unit (control center). In some airports, controllers work in the tower and the approach simultaneously, while in other areas, the approach and tower are quite separate from each other and work independently. In the environment of this study, controllers should perform both the approach and control tower duties. In the environment of this study, the controllers’ equipment and facilities for flight guidance include meteorological status equipment, current status declaration equipment for the airport area as the ATIS, radio conversation equipment with the pilot and control center, the light screen of the ramps and the airport region in the form of a touch screen with a flashing visual alarm system, and a radar screen to see the flights on the defined airlines. There is also an alarm system and a light gun for emergency situations to guide planes to the airport landing region in the case of losing radio contact, microphones and headsets for conversations with the pilot, and flight strips with certain colors for writing the information of each flight with respect to the flight direction (e.g., blue paper strips for departure flights, red paper strips for arrival flights). 1. Determining the external error mode (EEM): The EEM is actually the external and visible mode of actual or potential errors according to the reasonable consequences of one's wrong actions. Thus, the possible errors are described in three categories: qualitative and selection errors, sequence and time errors, and communication errors (Box 1). This classification of the EEM in the TRACEr technique has been adapted from Swain and Guttmann’s classification (13). As an example, the controller transfers incorrect data (communication error) or does not do monitoring (omission error of the qualitative and selection error type), 2. Performance-shaping factors (PSFs): This step classifies the factors that influence or can influence controllers’ performance and enhance error occurrence or help to improve errors in accordance with the factors classification in Box 2. 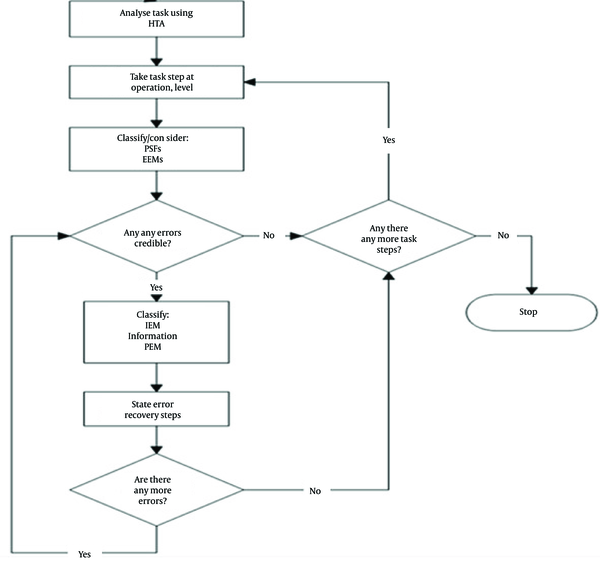 Identifying the internal error mode (IEM): In this step, the IEM is expressed and specific information is presented about what cognitive functions and what method failed or could fail. Error examination at this point is done in, 4.areas: perception, memory, decision-making and planning, and action in accordance with the error classification in Table 1. The TRACEr technique this step is based on a human information processing model (Figure 1) in which human error is considered an error in human information processing and is compatible with Wickens’s model from 1992 (8, 14). 5. Psychological error mechanisms (PEMs): PEMs involve psychological reasons for any internal error (Table 1). For example, the controller forgets to do flight monitoring and the psychological reason for this is that the controller was distracted by other tasks, 6. Error detection and recovery: At this stage, it becomes clear which errors can be identified and which can possibly be recovered. Finally, with the help of EXCEL software, data were analyzed and the percentage and frequency was determined for all errors. The implementation process used in this study based on the TRACEr technique is presented in Figure 2. HTA tables have been designed and TRACEr worksheets were also completed for controllers’ 11 major tasks. The HTA image of departure flight guidance tasks along with a part of its completed worksheets has been provided in Appendices of this article. The results of the TRACEr technique application for these tasks showed that in 84 sub-tasks derived by HTA, there were 315 errors in the controllers’ tasks. Regarding the percentage of error rates among external errors shown in Table 2, qualitative and selection errors accounting for 57% and a frequency of 73 form the largest number of external errors, followed by sequence and time errors with 23.40% and communication errors with 19.50% were respectively the most frequent external errors. Among the qualitative and selection errors, omission and then wrong actions on the right objects were the most frequent errors. Regarding the sequence and time errors, most errors were due to controllers’ late action. In the third category of errors, communication errors typically involved inaccurate and unclear transfers of information or unclear records of information. In classifying the internal errors, which include errors of perception, memory, decision-making and action, as shown in Table 3, memory errors (31.5%) were the most common, followed by perception errors (26.7%), action (26.2%), and decision-making (15.5%). Most memory errors are related to forgetting the action, prospective memory failures, and forgetting the previous actions. Perception errors tended to involve inaccurate visual perception, hearback errors, and the misreading of information; in the case of action errors, data transfer errors and then time errors were the most common types of errors. In the case of decision-making and planning errors, poor decision-making and inaccurate prediction were the most frequent. The results of the PEM and PSFs are shown in Tables 4 and 5. Among the PEMs, which account for the most probable reason for error occurrence, preoccupation and distraction were the most common causes, with 29.41%, followed by perceptional confusion, spatial confusion, and memory capacity overload. In the case of PSFs, the workload due to the traffic volume and the conversation load (induce of conversation between controller and pilot, controller and controller in other airport, controller and land safety) with (36.21%), personal factors such as fatigue and alertness (31.35%), and training and experience (9.71%) were the most common factors affecting controllers’ performance. To achieve the research aims, a predictive analysis of controllers’ cognitive errors in an airport control tower using the TRACEr technique was conducted. The most commonly applied method for human error identification in ATM is TRACER and this method can be used to ensure that all critical errors and human interactions have been identified (13). Therefore, the use of such a technique that is compatible with the study environment and tested for air traffic increases the accuracy and reliability of the results. The results showed that memory and perception errors are the most frequent in controllers’ tasks. Air traffic controllers’ tasks demand strong audio-visual perception, and controllers have to process a lot of information in a limited period. In addition, they need to constantly maintain their performance. Therefore, it is not surprising that perception errors occur, including information failing to be identified or detected, or inaccurately detected. The results of the current study are similar to those of Corver (2014). In Cover’s study, done in a control center, perception and memory errors were the most common errors. However, in this respect that perception errors prior considered memory errors Is incompatible So that in the Corver’s study, perception errors were more frequent than memory errors; this difference may be due to the different nature of the duties of the controller in the control tower versus in a control center (15). The results of another study involving 143 aviation accidents by Jones and Endsley, showed that 72% of the errors caused by controllers are related to perception errors (16). Regarding the types of perception errors, identifying errors are more related to tasks such as radio conversations, marking flight data on the flight progress strips, and monitoring the radar that appear usually as mishearing and hearback error. Regarding visual identification errors that is one item of types perception errors (Table 2), they mostly involved, wrong visual identification, not identifying or misreading that due to the use of handheld and radio devices by controller in directing flights, That, in this study, showed a greater proportion of the perception errors. Other types perception errors are detection errors that involve visual and aural recognition, more frequently involved in radar monitoring duties, in the form of flashing visual and aural warnings recognition, therefore in current study because use of flight strips, procedural method for guidance flights, Since the radar screen in the environment of this study shows flights on airlines on a monitor and has no means of seeing and hearing alerts. the controller does not use it in this field as a working tool, This error is less extensive, visual and hearing recognition errors have small frequency in the controller duties in current study. The types of perception errors (e.g., visual identification, hearback, and misread errors) identified in this study partially correspond with the types of perception errors in Corver’s study in 2014 (15) and Shorrock’s study in 2007 (9). Regarding the importance of the role of memory in the controllers’ tasks, it can also be said that memory lapses cause many events related to ATC (17, 18). This is due to the fact that memory is a significant determining factor of the air traffic controllers’ performance and the controller forms a mental picture of the various aspects of a plane and airspace using his/her working memory and long-term memory. Thus, understanding perception and memory errors can prevent many related events. Regarding memory errors, as shown in the results, forgetting tasks and prospective memory failure accounted for most of the memory errors in this study. The failure to remember scheduled tasks, such as writing a new height on the strip, updating, and adjusting the paths on the strip, coordination with the aircrafts, and the early transfer of a plane to the control center, usually occur when traffic is high. Shorrock also reported the highest frequency of this type of memory error in the results obtained by interviews with controllers in the control center and the results obtained by examining aircraft proximity incidents (10). The controllers’ tasks in a control tower are operational not operating (the characteristic of an operational task is to carry out an activity through perceptional paths to obtain information and then make a decision by retrieving information from memory and then taking action). Thus, in carrying out an activity at each stage of this process, some slips may occur that, in the result, appear as an error. Slips can occur just in the perception and memory stage and also involve other processing routes at the same time. In addition, the results of a study conducted in 2012 by Hassanzadeh confirm that the human error of cognitive failure that occurs in one or all three steps of processing information arises (19). Therefore, the controller should maintain continuously conscious attention to reduce the amount of possible errors. As also shown in the results, the most common psychological reason for the controllers’ errors was preoccupation and distraction. When a controller attends to other tasks, it can decrease his/her attention and lead to an error. As Jones also mentioned, this factor is the most common cause of controllers’ failure in monitoring or observing the data (16). Considering the fact that the controller can engage in various types of behaviors under certain circumstances, the identification and evaluation of factors that influence performance is a necessity for preventing and reducing human error to improve safety (20). Therefore, in this study, by identifying these factors, it was found that a high workload due to traffic volume, conversation load, and traffic complexity is the most important factor impacting controllers’ performance. Personal factors, such as controller’s fatigue, and then experience and training followed as the second and third most effective factors related to controllers’ performance. These results, of course, correspond with the findings of De Ambroggi, who examined all the factors that influence controllers’ performance in a safety case in a control tower (21). To assess the volume of air traffic and its impact on the incidence of human error in air traffic control, Moon et al. in 2011 showed that various types of human error in ATC are affected by traffic volume and a significant correlation exists between the traffic volume and human errors, which also shows the importance of the traffic volume factor. Therefore, it is necessary to estimate the appropriate traffic volume, air traffic control facilities, and aviation sector conditions to be considered (22). The importance of education and experience was also expressed as an important factor shaping performance in this study. A study done in 2010 by Mazlomi based on the CREAM technique, quality training and work experience is one of the factors associated with reduced quality performance (23). Thus, it is necessary to pay attention to training, and special attention should be given to the systematic planning and scheduling of training, retraining, and refresher educational materials adapted to the requirements of the job and design and implement, to be able hereby, the occurrence of errors in performing controllers’ duties can be prevented. e.g., through simulators’ design that different working conditions Including emergency situations, types controller performance in high traffic are tested, Strategies teach to deal with such situations. Thus, if we update controllers’ functional equipment and replace electronic equipment like electronic flight strips and electronically send direct orders instead of radio conversations as well as use support equipment to detect interferences, such as short-term interference alerts, we can reduce many perception and memory errors by early detection and by providing an opportunity to correct and improve errors as well as reducing controller’s mental load that is due to keeping high levels of data and at the same time quick and on time reaction, which requires the controllers’ continuous and conscious attention. Indeed. Mental workload will be reduced in various ways. First of all, mental workload has been reduced by either reducing the load on the working memory, or by replacing laborious tasks with tasks involving less actions or require less time with respect to the execution. A study in 2014 was conducted to assess the impact of controllers’ support tools on cognitive errors by performing a comparative analysis of the two operational environments using the TRACEr technique as a means of error identification. The findings indicated that errors related to detection, memory, decision-making, and action would be reduced by changing the operational system and applying modern equipment (15). We can conclude that the TRACEr technique, which was developed as a tool for classifying human errors and their causes in air traffic control, easily identifies and separates many errors due to the cognitive nature of air traffic tasks. The findings of this study led to the identification of many errors and the conditions affecting controllers’ performance, thus providing the ability to define safety and ergonomic interventions to reduce the risk of human errors. Therefore, the results of this study can be the basis of planning ATM to prioritize prevention programs and safety enhancement. This article is a part of Maryam Malekzadeh thesis sponsored by Ahvaz Jundishapur University of Medical Sciences. Thereby acknowledgement is offered to the university as well as the cooperation of airport officials, especially traffic controllers who sincerely helped us in this matter. Authors’ Contribution: Concepts: Maryam Malekzadeh, and Gholam Abbas Shirali; design: Maryam Malekzadeh, Gholam Abbas Shirali; data acquisition: Maryam Malekzadeh; data analysis: Maryam Malekzadeh; Manuscript preparation: Maryam Malekzadeh; manuscript editing: Maryam Malek Zadeh,and Gholam Abbas Shirali; manuscript review: Maryam Malekzadeh, Gholam Abbas Shirali. Funding/Support: This study was supported by Ahvaz Jundishapur University of Medical Sciences, Ahvaz, Iran. 1. In: Blom H, Bakker GJ, Everdij MHC, Van der Park MNJ editors. . Proceedings of European Control Conference. 2003 .